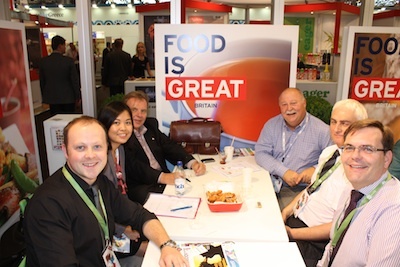 Economic development executives from the Ontario Food Cluster are attending SIAL Paris 2012, the world’s number one food exhibition, to attract more international companies to join Dr. Oetker and 3,200 other food and beverage processors in Ontario’s expanding $39 billion agri-food sector. In the case of Dr. Oetker, FedDev Ontario is contributing $10 million through its Prosperity Initiative for construction and equipment costs while Agriculture and Agri-Food Canada is providing $2 million through its AgriProcessing Initiative to help in the purchase of food processing equipment to make frozen pizzas. Dr. Oetker Canada Ltd., the fully owned subsidiary of the German-owned, fourth generation family business, expects to make up to a maximum of 50 million pizzas a year out of its new plant in the city of London, Ontario, including the Casa Di Mama, Panebello and Ristorante product lines. To do that, the company estimates it will need about 11 million kilograms of agricultural products – the annual equivalent of more than 400 tractor-trailer loads of food. In the epicenter of the Ontario Food Cluster’s supply chain, London also offers a highly skilled workforce via two colleges, a world-class university, and over 20 vocational schools. Strategic highway, rail and shipping transportation links feed into North America’s most populous region. London also offers plug-and-play food processing infrastructure including a $50 million water reservoir and pumping station with two pipelines to the Great Lakes, and a dual-feed hydro line for uninterrupted electric power to its Innovation Park where the new Dr. Oetker pizza plant is being constructed. Dr. Oetker Canada has been in operation since 1960 and ranks as one of the top five subsidiaries for the organization, which operates in over 35 countries, and has production facilities in 15. The Canadian unit produces over 300 products, and has doubled in size over the last five years due to new product development and a culture that thrives on innovation, quality products and fresh thinking. Today nearly one in three frozen pizzas sold in Canada is a Dr. Oetker pizza. The company also operates a manufacturing and R&D facility located in Mississauga, Ontario.